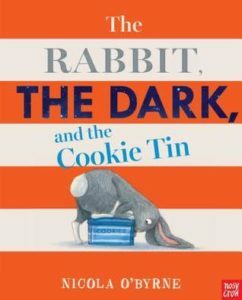 Library Displays, Posters, Sounds, Stickers, &c.
Rabbit doesn’t want to go to bed, so he comes up with brilliant plan: make it so the dark doesn’t come! He tricks the Dark into the cookie tin and can stay up as long as he wants, because it’s not dark outside. He realizes that it might not be the best thing to keep The Dark trapped in the tin. He sees the good in have the beautiful dark in its own time. Clever little story. Rabbit is also the hero in Use Your Imagination which we also enjoyed! And of course we love the pop out page. April 3, 2019 Josh W. — Also added to my to-read list.